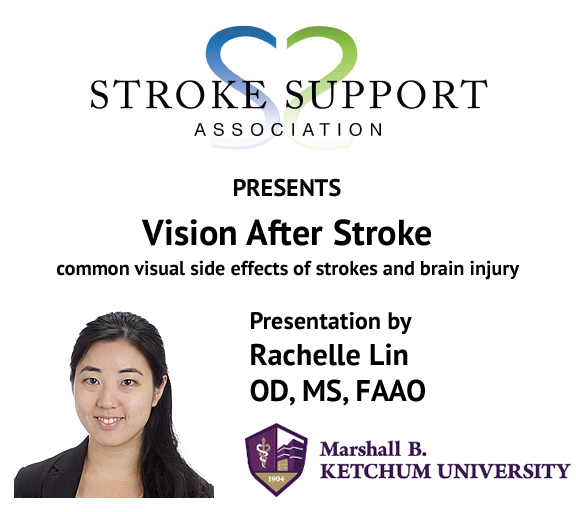 The Stroke Support Association invites you to join a special presentation by Dr. Rachelle Lin of Ketchum Health University Eye Center. Our regular stroke survivor and caregiver support groups will follow immediately after the presentation. Dr. Rachelle Lin received her Doctor of Optometry and Masters in Vision Science degrees from the Southern California College of Optometry at Marshall B. Ketchum University (MBKU). She completed her residency at VA Long Beach in low vision, traumatic brain injury, and primary care. Dr. Lin is currently an assistant professor at MBKU, where she practices in the Acquired Brain Injury and Low Vision Rehabilitation departments at the University Eye Center. She is a Fellow of the American Academy of Optometry, member of the American Optometric Association, and member of the California Optometric Association, where she serves as the Chair of the Low Vision Rehabilitation Section and President of the Orange County Optometric Society.